Dave Cook dons his Exo suit to find the new Havok DLC maps a great change of pace for Call of Duty: Advanced Warfare. Given that Call of Duty: Advanced Warfare places great emphasis on verticality, it’s little wonder that Sledgehammer Games has designed the first of its four DLC map packs with elevation and height advantages in mind. The Havoc pack often feels like it was crafted around the player’s new exo jump ability, and this is definitely a positive step, as it leaves the maps feeling complex and multilayered, yet dense and brimming with action. Boosting to a high ledge or rooftop might give a player time to pick off opponents on lower levels, but in many cases there are other vantage points nearby so that, thankfully, rooftop camping isn’t an option. These maps are all about staying mobile, and that makes for an exciting match indeed. 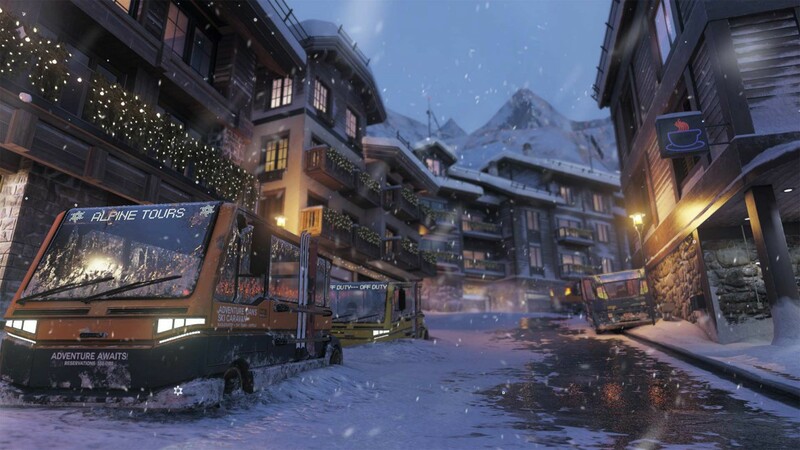 Set amid an alpine lodge resort, Drift is a superb map full of areas ripe for small skirmishes and tense exchanges. There are really three lanes to the environment, starting with a small Christmas market filled with low merchant stalls that seasoned exo air boosters can hop between without ever touching the ground. Just be sure to equip Blast Suppressor first. Warning sirens will sound around the five-minute mark and an avalanche will spew over this third of the map to crush stalls, topple Christmas trees and send plastic reindeer flying around the area. It’ll also kill you, obviously, so don’t be there when it all kicks off. 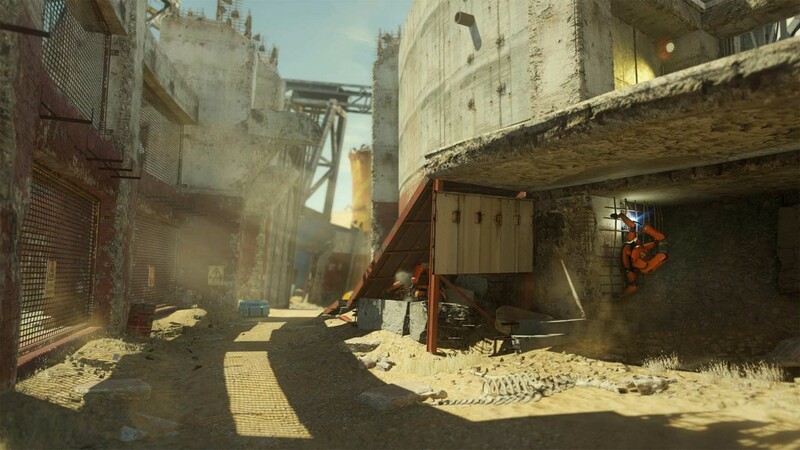 This area enables players to quickly dash around stalls or break off to other sections of the map between bursts of fire, while providing plenty of cover. Yet the stalls never fully conceal players at all angles so camping is out. The middle lane features a courtyard that boasts a spinning reindeer carousel. You can stand on it to earn some cheeky kills for your YouTube montage, or jump on top of it and hop between nearby shops and ski-lift terminals. In fact, you can cover a lot of distance in Drift without ever hitting ground level, and this middle lane is a quick but risky through-point. But it’s perhaps the third lane that impresses most in this brilliant map. It’s a train station with an elevated terminal building at one end, and shops at the other. Both of these ends are raised, with lower buildings in between. Again, you can boost jump your way from one end to the other by only touching rooftops if you’re careful, or enter into long range sniper battles from both sides. The choice is yours. Drift has great zone control sections, superb team deathmatch choke points and tense expanses, while delivering a festive backdrop filled with all new assets and some jaunty carols in the process. Lovely stuff. This is a weird map concept, as it’s a ravaged clown-themed motel that feels like the stuff serial killers dream of. Strangeness aside, this is another great map that shakes things up by taking a step away from tight corridors and presents wide areas with sparse cover. It’s all wrapped around a motel sign, which is essentially a big clown that periodically laughs and spews one-liners, will launching firework bombs from under its hat. These little buggers will explode after a few moments with a wide blast radius, so it’s best that you steer well clear of them. One spawn zone is placed next to a car wash and sewer trench, which offer little in the way of cover. The other zone can be found next to a mine shaft, while the motel itself serves as a contested middle ground for battles. It’s a two floor structure with many rooms, stairways and of course, rooftops that exo jumpers can use to their advantage. This is definitely a map that rewards slower, tug-of-war play. Running out into the open on Sideshow will get you very dead, very quickly, and great consideration is needed when stepping out from behind cover. Raise your aim before doing so, check your surroundings and cloak up if you have the skill equipped. What you’ll find during matches on this map is that pockets of each team will hunker down on either the gas station roof at one end, and the motel roof at the other. You need to be seriously aware of snipers here, and it might pay to equip a thermal scope to your long range weapon to improve visibility. This is another good map with a unique environment, and a different pace from most of the on-disc efforts. Every dash across open ground is a gamble here, so just remember there are few places that guarantee total safety, and think twice before making a break for it. This is a thoroughly complex map to get your head around at first but the twisted wreck of scrap metal and old reactor parts is a real playground of carnage. It’s all so incredibly uneven, thanks to thick sand piles clogging up the map’s border, crude rising walkways made from junk, and underground pipelines running below the environment. Danger can come from any angle here. This is most certainly the opposite of Sideshow’s broad routes, with plenty of tight corridors broken up with wider expanses. One particular area of note offers a raised platform that acts as a stepping stone across a pool of non-lethal sludge. The area is big enough to encourage mid-to-long range exchanges, but the option to drop down and take the sewers below makes it a neat but risky shortcut. However, like Sideshow, you will need to exert caution as you turn every corner, thanks to a myriad of vantage points and sneaking spots concealed amid the wreckage. One side offers circular sections of cooling tower that can be entered and defended by well coordinated teams, while the sandy courtyard outside is a deathtrap for idling soldiers. This particular area also boasts two raised points at either end where teams can hole up, but as we learned the hard way, it’s easy to get flanked and killed if you aren’t watching your rear, thanks to the labyrinthine alternative routes on offer. Meanwhile, the pipelines below lead to wider caverns that are ideal for campers to get perhaps one lucky kill, but rest assured, this isn’t a map that lone wolves will fare well on if they simply stand in one place for too long, because you’re never too far from another player eager to pick you off. Like Drift and Sideshow, the key to winning on Core is to keep moving, or hole up with team-mates. The central reactor room on the map’s lower level is a real treat – a cavernous kill-room that invites players to enter into a grand skirmish from all angles. With four points of entry, and some low cover, this chamber is reminiscent of the underground bunker in Call of Duty: Modern Warfare 2′s map Wasteland. That’s certainly a good thing, but don’t expect to live long down there if you’re unprepared. This map impresses with superb visuals and a sheer volume of activity. Everywhere you look there are toxic clean-up robots walking around cleaning up gunk, or welding the scenery. It certainly feels more alive than other Call of Duty maps, that’s for sure, and it positively sings on all modes. Lastly, Urban deserves note for its superb design alone. 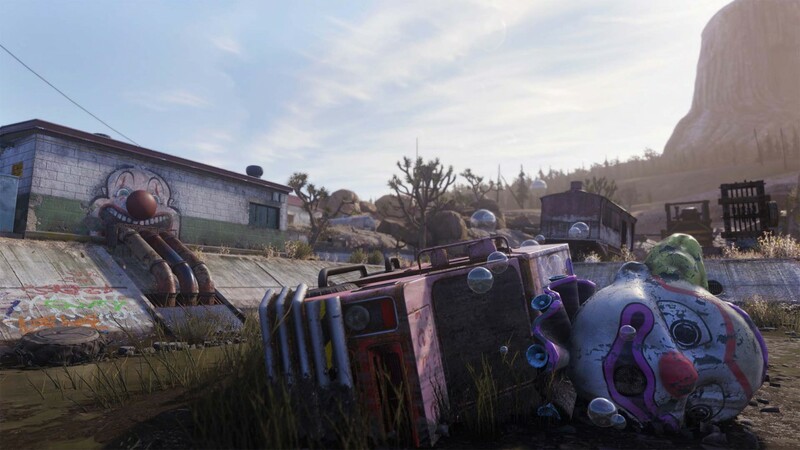 It’s set in a section of Texas which has been placed under Atlas curfew and it certainly has a Half-Life, City-17 vibe about it. It’s bleak yet stylish. Confidently the smallest map on offer, players can choose to enter a multi-storey building in the centre of the environment, or skirt around the sides using lower terrain. One flank is elevated with two sets of stairs leading up to a raised point in the middle, while the other features a low hover bike parking area surrounded by security walls. Due to its small size, it’s advised that players should refrain from running around Urban like a lunatic to avoid being picked off by enemies coming the opposite way, or someone lying in wait at an elevated window. It’s best to avoid the street below if possible, and to only use it when making a quick break from one area to the next. What we found is that most players gravitate towards the two staircases that meet in the middle. It’s the area with a big sign that reads ‘Century Station’ and it appears to be a hot-zone based in our matches so far. It’s a quick way to cross the map but it gets insanely messy up there. There is a central rooftop area below these staircases that creates space between both halves of the central, elevated building. This area, once again, is a potential deathtrap for anyone who idles too long. What you have on either side are essentially two towers that are great for exchanges over open terrain, but players should be wary of taking a fist or knife to the back if they window-camp too long. 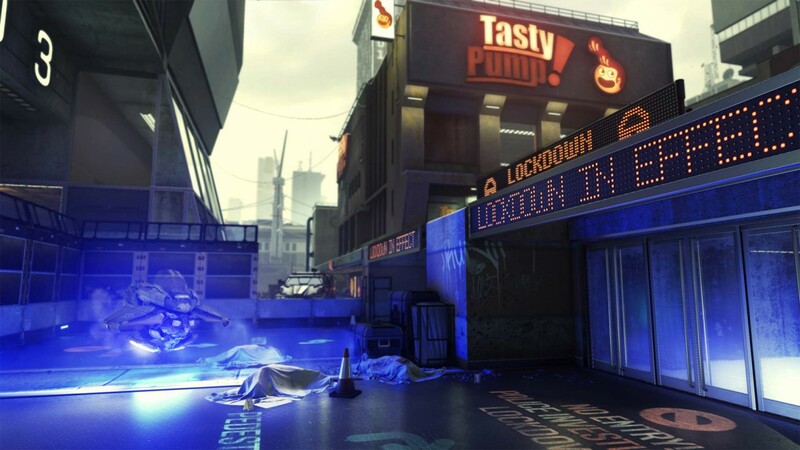 The map expands over time, as curfew areas around one side of the map – the one with the hoverbike car park – open up. These tight, claustrophobic processing rooms hold pillars and dark corners that should be a shotgun fan’s dream, and a potential nightmare for those who tread without caution. They can be used to avoid the chaos of the central area and enter into a different pace of play. It really is an insane map with a high kill rate that remind us of Call of Duty 4′s Shipment. While Urban is aesthetically spot-on, it does feel restrictive and prone to campers. There are too many tight corners that give players cover on most sides, which is something of a flaw in design, but this niggle aside, there’s certainly something old-school about fighting over one central, contested building. Some will love it, but we’re sure others won’t stomach the rapid fire deaths. With three stellar maps on offer and one that will perhaps reveal itself as great for objective play over time, the new maps for Call of Duty: Advanced Warfare are a great bolt-on to the core multiplayer experience, offering fun design, imaginative locales and a different tempo from the on-disc efforts. 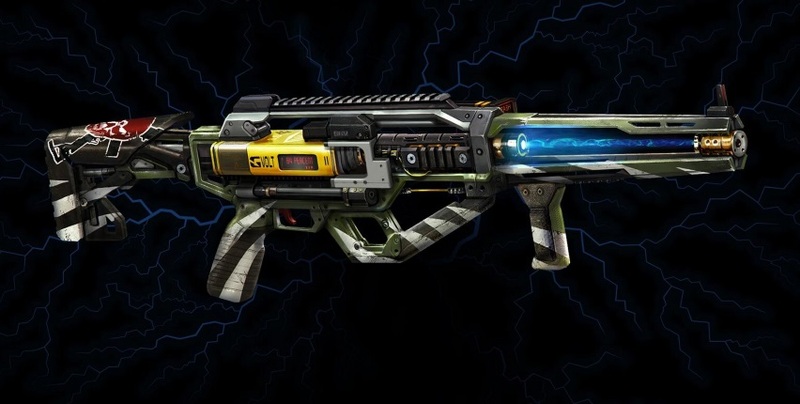 There’s also the AE-9 Widowmaker energy weapon – an unwieldy, slow firing face-melter which packs a brutal punch. It boasts unlimited ammo but is prone to overheating delays, and while it’s strong, it suffers greatly over long range. Treat it like an SMG with LMG handling and you’ll be fine. There you have it; a strong start to what hopes to be a solid season of new content. Read Dave’s impressions of the Exo Zombies co-op mode for Call of Duty: Advanced Warfare right here.